Here’s a great idea for souvenirs with a purpose – collect Christmas decorations to remind you of your adventures. I’m looking at Christmas decorations from around the World and Christmas Decorations from the US. We had a beautiful sunny Christmas day here yesterday (28 C). 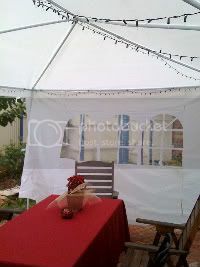 We ate lunch outside in our new shade pavilion (read: very budget white tent). We didn’t have a BBQ but we did have pavlova. And that’s how we have a white Christmas in Australia. Europe of course is a totally different matter. I would love to visit the Christmas markets and eat Christmas cake and mince pies while it is snowing outside. It’s not going to happen this trip because theme parks being open had a higher priority. Also many of the cheaper end options for accommodation actually shut up shop from September. This is different to the Down Under way of doing things where campsites remain open all year round. Not that I’d want to be camping when it was snowing either . Anyway, celebrating Christmas in Europe remains a dream for another time.